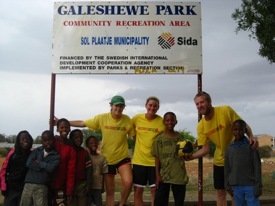 Kristen Fladseth, Anna Barrett, and Peter Glidden pose with local Galeshewe children during the 2009 Galeshewe Dribble-A-Thon. In early September, GRS intern Peter Glidden was contacted by his former employer, The Greenwich Country Day School, about an all-school fundraising event called the “GCDS Walk-a-thon.” This walk-a-thon is an event that raises money for two NGOs every fall—one domestic and one international. Students, faculty and staff spend an entire day walking laps around the school campus to earn donations per miles completed. This year the GCDS community selected Teach for America and Grassroot Soccer as the organizations to support. The event was a great success, raising over $5,000 for GRS, and in a notable departure from the traditional GCDS walk-a-thon, participants embraced the GRS vision and dribbled the majority of their miles. Somewhere over 7,000 miles away, on a different continent, in the opposite hemisphere, on a seemingly sunny October afternoon, Peter and a small group of fellow GRS interns embarked upon a similar expedition. This adventure unfolded in the sparkling city of Kimberley, South Africa. The four interns, Peter, Kristin Fladseth, Anna Barrett, and Lindsay Rotherham, were outfitted with only their bright yellow Grassroot Soccer t-shirts and two Nike soccer balls. 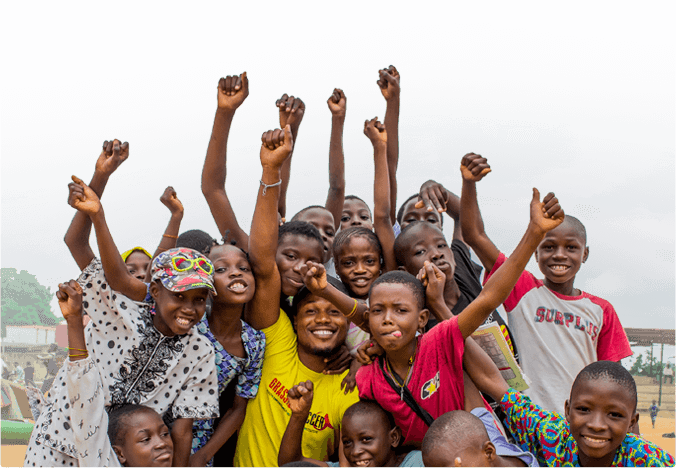 Their goal: to dribble approximately 15 km from their home, throughout the heavily trafficked roads and lively neighborhoods of Galeshewe, the nearby township, and finally loop back to return home. Excitement was in the air with a fast approaching storm in the distance and many kilometers to be traveled. The interns started strong on some of the quieter and well-maintained streets of the city. As they neared the township limits, however, the atmosphere changed, and they were greeted by honking cars and enthusiastic bystanders. Interest mounted as the group dribbled toward a local park and called out to people in the native Setswana. Slowly but surely kids emerged from their homes to join in the football festivities, including participants from the most recent Skillz Holiday Programs. A left hand turn took the group onto the busiest road of Galeshewe, where they were ambushed by a horde of intrigued and ecstatic kids. It took only a few passes and dribbles amongst the group of twenty plus children before they were totally hooked to these strange yellow-clad foreigners. Together, they continued on down the road into the heart of Galeshewe, laughing, dribbling, dancing and generally loving this bizarre experience. When the group reached the round-about in the town center, storm clouds had fully formed and rain began to fall upon this unlikely group. Grabbing as many of the small boys and girls into their arms as they could, the interns headed for shelter in a local school. After several minutes of soccer drills underneath an overhang, lightning moved the crew into a classroom, providing an opportunity for some familiar American games. “Heads up seven up” was a big hit as the kids struggled to guess which intern had selected them. Eventually the sky cleared and the group began their long journey home. A bittersweet goodbye was said to the young, shivering troopers as the wet, deflated soccer balls rolled on their proverbial path through Galeshewe Park and back onto the wide, soggy road home. This article was written by the GRS interns in Kimberley, South Africa.